ISLAMABAD, Dec 21 (APP): Federal Minister for Planning, Development and Reform Ahsan Iqbal Wednesday said that China-Pakistan Economic Corridor (CPEC) would prove a game changer for Pakistan which was needed to be aligned with academia. 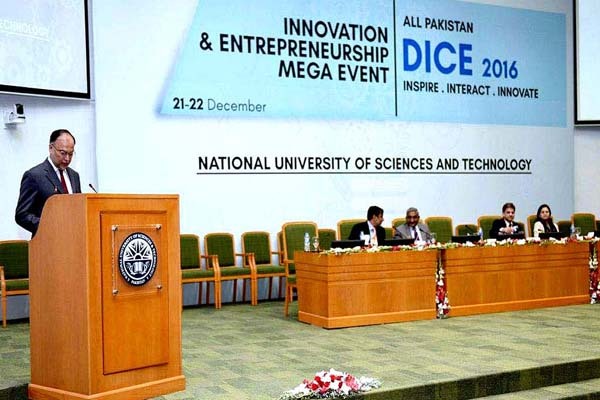 Ahsan Iqbal said this as a chief guest in inaugural ceremony of ‘Innovation and Entrepreneurship Mega Event 2016’ organized by NUST and DICE Foundation, said a statement issued here. The event aimed at building a culture of innovation and entrepreneurship in Pakistan. Speaking at the occasion, he commended the efforts of DICE Foundation in promoting the entrepreneurial spirit in the country by providing a platform for academia, industry, government, entrepreneurs and expatriates. Pakistan was the 4th largest e-lancing country and had experienced digital economic boom in the last decade, the minister added. He highlighted government’s plan to open up a university in each district of Pakistan and to establish a Pak-US Knowledge Corridor in which 10, 000 scholarships would be provided to Pakistani students at top US universities in the next 10 years. curriculum reforms, examination system reforms and teacher training programs to revolutionise the education sector, he added. He said that innovation was the latest currency of competitiveness. Ahsan said that the difference in countries and societies was not only restricted to resources but it was also in imaginations and innovation. He also encouraged young students by visiting their stalls in NUST innovation and entrepreneurship mega event and said that key to Pakistan’s development was in scientific inquiry and innovation.